This customer, a manufacturer of iron fittings for the water and waste-water industry, had a $1,000,000 back log of orders. They were having difficulty keeping up with the final cementing and painting requirements and their facility was becoming congested with forklifts and other equipment and machinery. They needed a solution for accumulating the large volume of cemented pipes and to move them through the painting process. The system had to be capable of handling parts weighing up to 400 lbs. 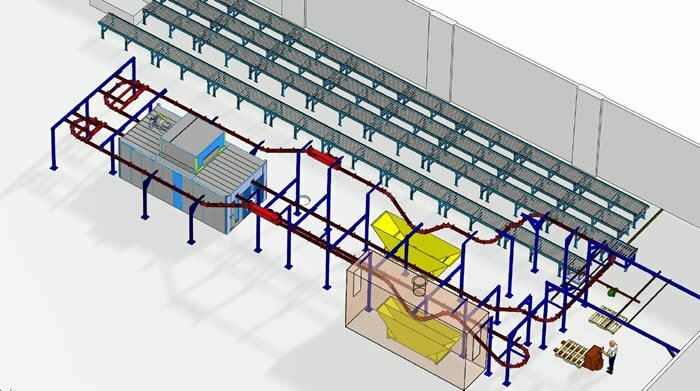 Using Solidworks drawings, the engineers at PACLINE Overhead Conveyors designed a system that utilized a combination of roller conveyors and the Pacline PAC-MAX™ heavy duty overhead conveyor. In designing the new finishing system, the first issue to be addressed was the need to accumulate and cure the very large volume of parts prior to the painting process. To handle this, several banks of roller conveyors were installed. PACLINE supplied a transfer cart that would dock with the roller conveyors. This allowed the customer to shuttle the skids of cured parts from the roller conveyors onto the transfer cart. The cart was then undocked and manually pushed to the PAC-MAX™ overhead conveyor line. Here, the skid of pipe fittings was pushed onto a scissor lift. The lift was operated with a pedal keeping the operator’s hands free to attach the part to the load bars which were hanging from the overhead conveyor. Using PAC-MAX™ 45 and 90 degree curved tracks, the PACLINE system carried the heavy parts through the dip tank where they were painted and then into the paint oven for curing. PACLINE also supplied a crane for unloading the large heavy pipe fittings at the end of the paint line. The new system improved the workflow and overall efficiency of the paint line. Utilizing the Pacline PAC-MAX™ enclosed track conveyor also resulted in a paint finishing solution that allowed the customer to conserve valuable space in their facility. 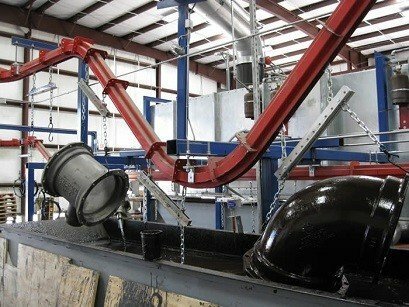 The PAC-MAX™ enclosed track conveyor also allowed the customer to utilize a much smaller, less costly dip tank for their large pipe fittings. And finally, the smaller dip tank ultimately utilized less paint and was a cleaner option than an I-beam system.